I am still on the mango kick. With all the mangoes we picked, no wonder. If you are new here, remember all the mangoes we harvested this year. I made so many dishes, but have not been able to get them all posted. Plus you would probably be bored with mango, mango recipes day after day. 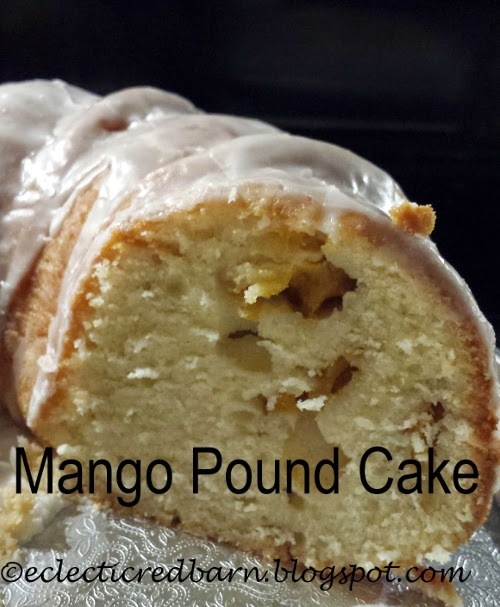 I thought I would share my mango pound cake. Although I used fresh mangoes in my pound cake, you could use frozen mangoes. The mangoes made the cake very moist. I put a buttermilk frosting on it, but you could also just sprinkle it with powdered sugar. Welcome to my last week of co-hosting at Happiness is Homemade Link Party!!! for July. What a wonderful experience it has been. I have met so many new friends and all of your projects, DIY, recipes and crafts have been so inspirational and helpful. Thanks to my wonderful hosts and co-hosts for allowing me to share this month with them. I like forward to seeing all of your new ideas this week. First, let's check out some of last week's links. 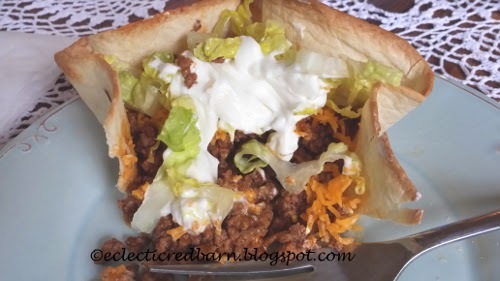 I am sure you have all seen those taco pans advertised on TV at one time or another. But wait, if you call right now, you can get a second set for free, only pay the shipping and handling. !!!! Woohoo! It has been some time since I posted about our girl Tiny. 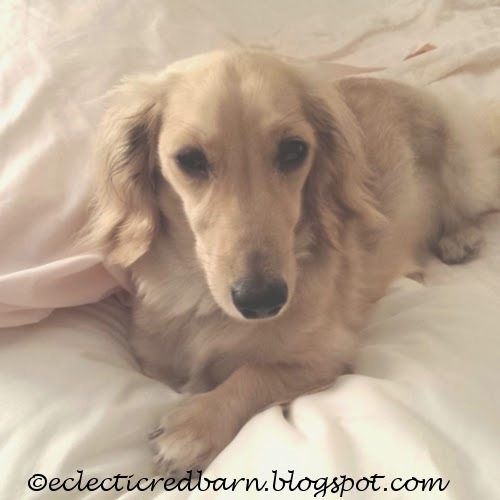 In case you missed her story, she is a one year old long-haired English Cream Dachshund. She suffered some neurological issues in February, no one knows what or why. It was touch and go several times, but finally she has been doing better. It is week three at Happiness is Homemade and I am excited to be here for another week of inspiration. Each week just seems to get better and better. We hope you will come and share with us again this week. See you at the party! I don't know about you, but I love buttons, especially vintage ones. Over the years I had collected quite a few. Anytime I see them, I can't resist. Recently, I found several containers at a yard sale of just white ones. Most of them weren't old, but I love the pearl look of some of them. What to do with them? I had also purchased 4 Styrofoam balls for 25 cents. I wanted something for my vintage painted White Clad side table that I posted. I created this button ball and put it in a tea cup. 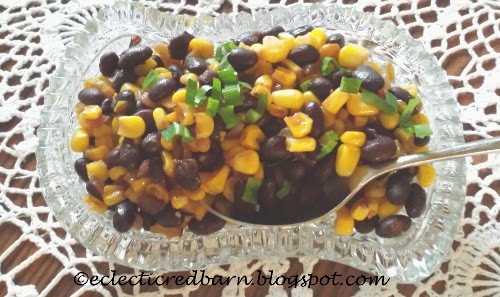 I love to make all kinds of salads in the summer and this Black Bean and Corn salad is great. You can serve it hot or cold. There are a lot of black bean and corn salads out there but I adapted a couple recipes to come up with my own version. Welcome back to another great week at Happiness is Homemade Link Party!!! What a great party we had last week, so many great project, recipes and ideas were shared. I can't wait to see what you are up to this week! My daughter and I were out treasure hunting when we came upon this little side table. It needed some love but I liked the fact that it looked like a mini vintage fridge. At $12 it was a no brainer. That is not how it looked when I bought it however. It was solid but banged up. Yikes, what a cactus! 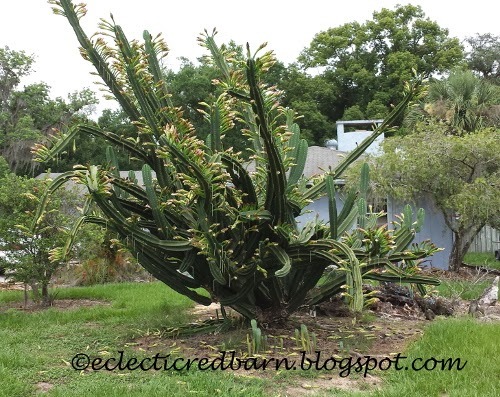 I see lots of cactus around Florida, but this one is amazing. It looks so menacing and beautiful at the same time. Still making dishes with all my mangoes. 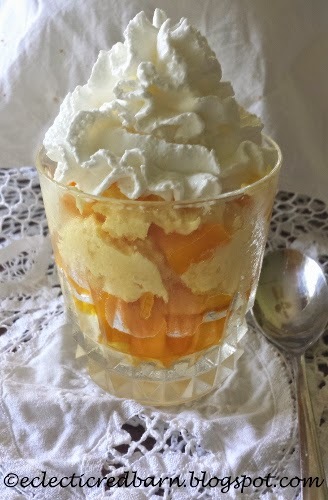 I love to have a light and refreshing dessert once in awhile and these parfaits hit the spot. I changed the original recipe from Kraft Foods to make it healthier. The family had no idea I changed to light ingredients. Thanks for coming over to Happiness is Homemade Link Party!!! Hope everyone had a fun and safe 4th of July! I am so excited to be one of four co-hosts for July at Happiness is Homemade Link Party. What a great way to spend the month seeing all of your creations and sharing it with such fabulous ladies. We have our 4 new July co-host's here at Happiness is Homemade Link Party #27. So make sure to take the time to stop over and visit their pages! If you want to help us co-host in August just fill in the Rafflecopter information below! I have always loved the look of twisted wires. I would see them and want some for my projects. I tried to twist them myself, but they never looked quite right. Then one day, while I was frustrated with the darn wires, my husband said, "let me see what I can do". He is so smart and came up with this idea for me and ever since, when I need twisted wire, I know how to make it. 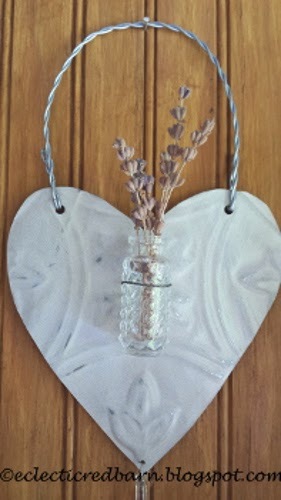 Recall that I used it on this tin heart vase holder that I shared with you in May. Happy 4th of July and the third reason for celebrating at the Triple Celebration Giveaway. The Triple Celebration Giveaway had 3 reasons to celebrate: Celebration#1 – God’s Growing Garden turns 3; Celebration#2 – Canada Day on July 1st – Canada turns 147 years old and today's Celebration #3 - July 4th – USA turns 238 years old!! The celebration is still going on and we hope you stop by and check out the wonderful prizes and meet all of the hosts for the party. We have Cash prizes, Ad space and Gift prizes. You don't want to miss it. 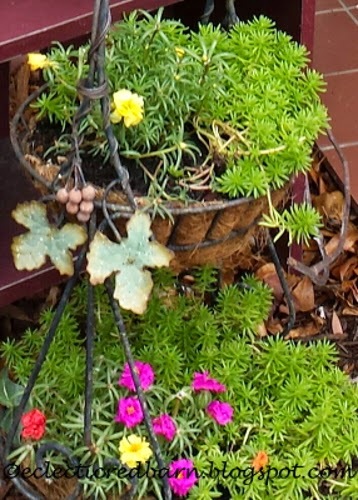 Back in November, I found this two-tiered stand at a garage sale for $1. Celebration#2 at the Triple Celebration Giveaway! Today is July 1st and the second reason for celebrating at the Triple Celebration Giveaway. The Triple Celebration Giveaway had 3 reasons to celebrate: Celebration#1 – God’s Growing Garden turns 3 and today's Celebration#2 – Canada Day on July 1st – Canada turns 147 years old.